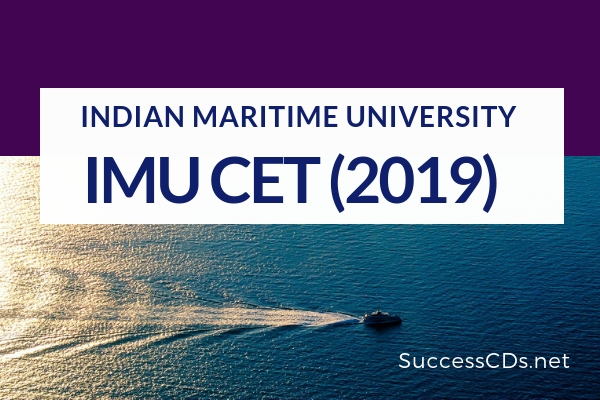 IMU CET 2019 Exam will be organized by the Indian Maritime University (IMU). This university offers various UG, PG, PG Diploma & Research Courses in the field of Marine Engineering. Candidates can pursue B.Tech, B.Sc. M.Tech, BBA, M.Sc, MBA, etc courses at IMU campuses & its affiliated colleges. In this notification, candidates can get detailed information about IMU CET 2019. All admissions to the various UG and PG Programs of the IMU and its Affiliated Institutes for the Academic Year 2019-20 starting on 01st August 2019 will be through an all-India Online Common Entrance Tests (CETs) which will be conducted on Saturday, 01st June 2019 between 11.00 am and 02.00 pm. Candidates will be required to clear this CET in order to be eligible for admissions to the respective Programs. There will be a CET common to all UG Programs. There will be a CET common to the 2 MBA programs; another CET common to the 2 M. Tech Programs. Admissions to Diploma in Nautical Science leading to B.Sc. (Applied Nautical Science) Program in Affiliated Institutes are open only to ‘sponsored candidates’, i.e. candidates sponsored by Ship Owning or Managing Companies who qualify in IMU’s CET for UG Programs. Admissions to Diploma in Nautical Science leading to B.Sc. (Applied Nautical Science) program in Affiliated Institutes are open only to ‘sponsored candidates’, i.e. candidates sponsored by Ship Owning or Managing Companies and who qualify in IMU CET for UG programs. In case of SC/ST candidates there will be a 5% relaxation in eligibility marks; however, it will not apply to English marks. 10+2/equivalent (PCM-60% & English-50%). In case of SC/ST, candidates there will be a 5% relaxation in eligibility marks; however, it will not apply to English marks. Candidates with Diploma in Marine /Mechanical Engineering with at least 60% marks overall are eligible to apply for Lateral Entry. The applications for this will be invited separately by the respective IMU Campuses/ Affiliated Institutes. 10+2/equivalent (PCM -60% & English- 50%). In case of SC/ST, candidates there will be a 5% relaxation in eligibility marks; however, it will not apply to English marks. Candidates with 60% marks overall in 4-year Diploma in Ship Building Engineering from the Institute of Shipbuilding Technology, Goa [OR] 3-year Diploma in Naval Architecture and Offshore Engineering from the AMET University, Chennai [OR] 3-year Diploma in Mechanical Engineering/Civil Engineering from any Institute approved by AICTE, will be eligible for admissions by Lateral Entry into the second year against the available vacant seats at the beginning of the second year. The admissions will be made in the order of merit based on aggregate percentage of marks. The candidate should have completed the diploma within its stipulated duration of 4 years or 3 years as the case may be. Age limit – 18 to 26 years. Candidates with B.Sc (Ship Building & Repair), who have at least 60% marks overall and have completed the degree within the stipulated period of 3 years, will be eligible for admissions by Lateral Entry into the third year. The number of seats for this lateral entry are ‘20’ and available only in IMU Visakhapatnam Campus. Age limit – 19 to 27 years. No. of Questions - 200 multiple choice questions. No. of Questions - 120 multiple choice questions. Candidates have to apply online www.imu.edu.in. The Indian Maritime University has been conducting Online CETs from 2019 onwards. All the stages from application to publication of results are now online. All documents need to be put into an envelope and needs to be sent to Admission Cell, Indian Maritime University, East Coast Road, Uthandi, Chennai-600119.